As this little book goes to press, Massachusetts, by an act of its legislature, is made the fourteenth state in this country that requires the pupils in the primary, as well as in the higher grades of public schools, to be taught the effects of alcoholics and other narcotics upon the human system, in connection with other facts of physiology and hygiene. 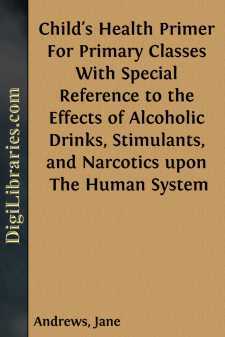 The object of all this legislation is, not that the future citizen may know the technical names of bones, nerves, and muscles, but that he may have a timely and forewarning knowledge of the effects of alcohol and other popular poisons upon the human body, and therefore upon life and character. With every reason in favor of such education, and the law requiring it, its practical tests in the school-room will result in failure, unless there shall be ready for teacher and scholar, a well-arranged, simple, and practical book, bringing these truths down to the capacity of the child. A few years hence, when the results of this study in our Normal Schools shall be realized in the preparation of the teacher, we can depend upon her adapting oral lessons from advanced works on this theme, but now, the average primary teacher brings to this study no experience, and limited previous study. To meet this need, this work has been prepared. Technical terms have been avoided, and only such facts of physiology developed as are necessary to the treatment of the effects of alcohol, tobacco, opium, and other truths of hygiene. To the children in the Primary Schools of this country, for whom it was prepared, this work is dedicated. CHAPTER I. JOINTS AND BONES. ITTLE girls like a jointed doll to play with, because they can bend such a doll in eight or ten places, make it stand or sit, or can even play that it is walking. Jointed dolls. As you study your own bodies to-day, you will find that you each have better joints than any dolls that can be bought at a toy shop. Some of your joints work like the hinges of a door, and these are called hinge-joints. You can find them in your elbows, knees, fingers, and toes. How many hinge-joints can you find? Think how many hinges must be used by the boy who takes off his hat and makes a polite bow to his teacher, when she meets him on the street. How many hinges do you use in running up-stairs, opening the door, buttoning your coat or your boots, playing ball or digging in your garden? You see that we use these hinges nearly all the time. We could not do without them. All our joints are not hinge-joints. Your shoulder has a joint that lets your arm swing round and round, as well as move up and down. Your hip has another that lets your leg move in much the same way.